"This hole...! It was made for me!" A short horror manga story by Junji Ito, printed as a bonus one-shot alongside his fish-zombie-apocalypse manga Gyo. A boy named Owaki, and a girl, Yoshida, meet on Amigara Mountain, where an unsettling discovery has been made. Human shaped holes are scattered across the mountain, and it soon becomes clear that the holes are "calling" to the people they are shaped like. So what happens when they enter the hole? Well, you can be sure that massive amounts of claustrophobia and Nightmare Fuel are involved. Can be read here . Should it seriously disturb you, counter with liberal application of this comic ◊ or this one, ◊ or this one. , or possibly even this one , or this one ◊, or this one , or this one . There's also a dramatic reading. And another. And I Must Scream: The walls are patterned so that you can only move forward. Most likely it is a sawtooth pattern ◊, making it more difficult to go against the flat part of the ridge as opposed to the slanted part. All There Is to Know About "The Crying Game": Let's just say "the ending" and leave it at that. Body Horror: There are better ways to go on a diet. Catapult Nightmare: Provides the trope page image. Claustrophobia: You will have it by the end of the story. Daylight Horror: Most of the creepy stuff happens at daytime. Dreaming of Times Gone By: Everyone who has a hole carved for them. Eldritch Location: There is something seriously wrong with the fault and the holes running straight through it. Fan Disservice: People usually undress in order to fit into the holes, and not all of these people are attractive. Owaki stripping to his underwear (or less, considering the fact that we only see him from the waist-up) would be fanservice if not for what will eventually happen to him. Fate Worse than Death: In Owaki's dream, he is a man from a primitive tribe condemned to a hole for an unforgivable crime. Fold Spindle Mutilation: A rare case where the mutilation isn't fatal. Impact Silhouette: Inverted. The holes were already there and each one is seemingly tailor-made to resemble a specific person. Anyone who finds their hole is then compelled to enter it. Maybe Magic, Maybe Mundane: It was never explicitly said the fault was actually supernatural. More Than Mind Control: Once a victim sees their hole, they're compelled to enter it. Not in the mindless sense of "Must. Enter. Hole. ", but in the more lucid sense of, "...I don't want to do this, but I feel like I must." which actually makes the whole thing scarier. 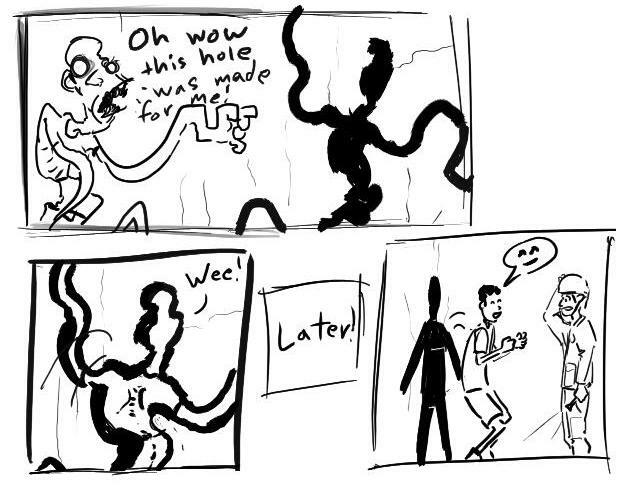 Noodle People: Literally - when people enter "their" hole, they are stretched in every direction until their limbs are thin like tentacles, yet are still alive. Nothing Is Scarier: What kind of horrific supernatural phenomenon is causing the holes to appear? We never get any answers. It just happens. Primal Fear: This manages to hit isolation, darkness, the unknown, claustrophobia, and body horror all in one fell swoop. Schmuck Bait: A prime in-universe example. Shown Their Work: As per the dream, there were people in Japan as early as 50,000 BC. They also developed stone-carving technology remarkably early. Token Romance: It was really unnecessary for Owaki and Yoshida to get together, though it's possible that it happened so that we'd get a giant Hope Spot, before things get worse. Wham Shot: What happens to the people inside the holes. Rather, the earlier shot showing the discovery of the misshapen holes illustrates the image a lot sooner. ズ. The first two are rendered "SSLL" and "SLIP", but the last is the famous, "DRR... DRR... DRR". Which, apart from being a nonexistent Japanese phoneme (it could be "ZU... SU... ZU"), this transliteration is so obtuse that people are apparently under the impression that this is the sound of the disfigured peoples' groans rather than the sound of them sliding through the tunnels. These are squicky sounds, people!